There is no slowing down the development in Milton, Ontario. Known as the fastest growing community in Canada, its population has more than tripled over the last 15 years. The completion of “The Big Pipe” project to draw water from Lake Ontario, has flowed a constant stream of new homeowners and businesses to the city, including ShadeFX’s manufacturing facility. With the steady-growing population comes an ever-growing demand for improvements in infrastructure and technology. 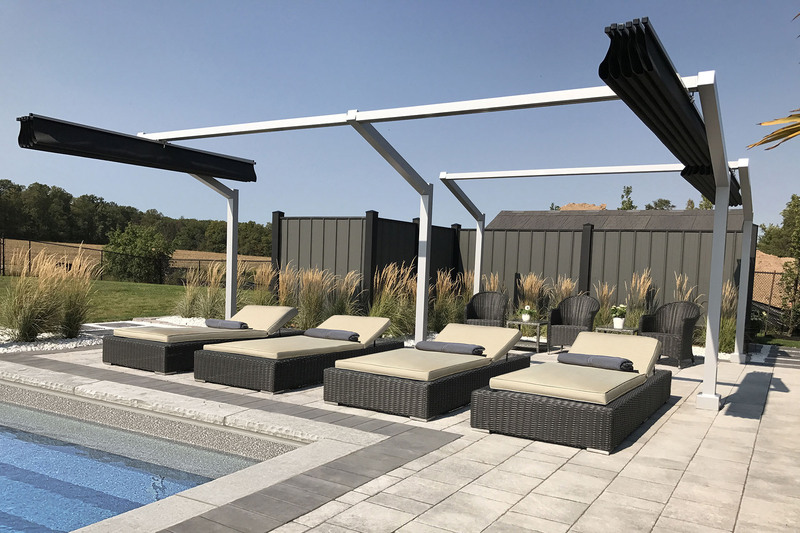 Was it fate that ShadeFX debuted its newest product – the Freestanding Retractable Canopy System – in this quaint but booming town? One thing is for certain, we wasted no time in seizing the showcasing opportunity. 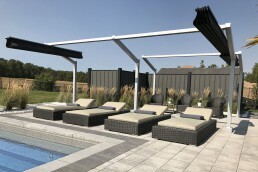 Our innovative dual post retractable shade system was the ideal solution for Milton homeowners Dennis and Teja whose newly-renovated backyard demanded functional shade and wind-resistant coverage when lounging by their pool. 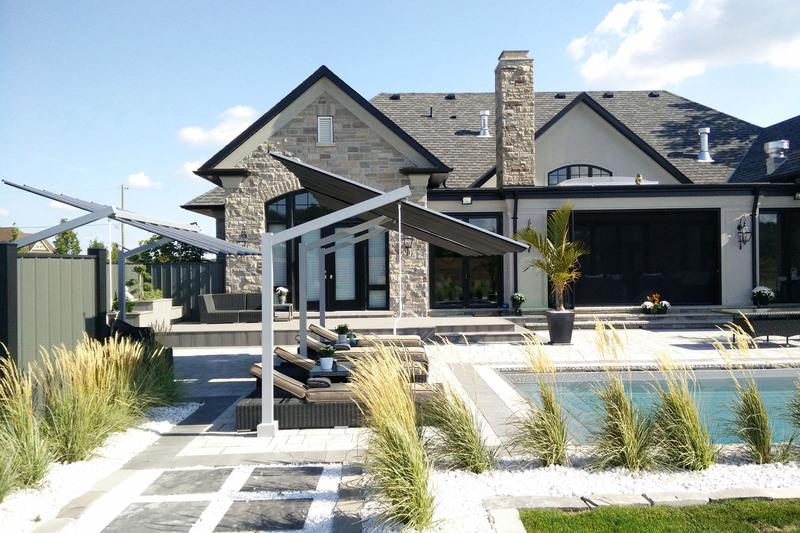 Looking to emulate the luxurious poolside patios often found in South Beach, Dennis and Teja initially opted for a couple large scoped umbrellas to complete their outdoor oasis. However, it didn’t take long for disappointment to set in. Constant repositioning and toppling of the umbrellas under moderate wind conditions took away from the intention of the space – to relax and unwind. 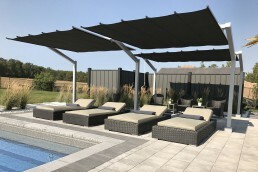 “After researching many different sunshade options for our new backyard, we ultimately settled on large scoped umbrellas. Unhappy with the limited coverage, and instability under mildly windy conditions, we looked into alternative solutions. 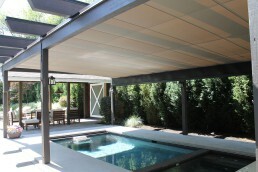 The Freestanding Retractable Canopy was designed and engineered in response to consumer demand. Its extended robust sun and rain protection can be fully or partially retracted to provide desired coverage at any time of the day. Its shades can also be tilted 20 degrees from horizontal to cast large shadows as the sun carries through the day. 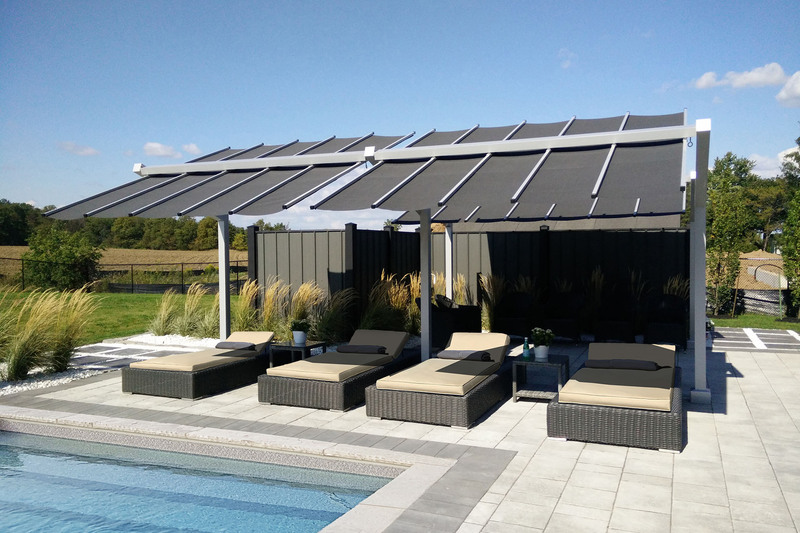 Wind rated, with multiple mounting options, the canopy’s sleek and modern design can be customized to fit any space. “After using the systems for a summer, I can say it withstands any gusts of wind tossed its way. Our favourite feature of the system is the ability to partially retract the shade, providing sun to those who wish, and shade to others. Like Milton, ShadeFX’s mission is to constantly and consistently evolve and adapt to the markets ever-growing demands and needs. 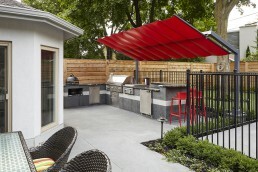 The Freestanding Retractable Canopy system answered the call for a more modern and functional version to the large scoped umbrella. 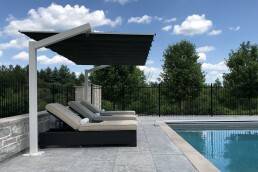 Seeking extended poolside coverage that could withstand escarpment winds, the homeowners ultimately decided on replacing all their large scoped umbrellas with ShadeFX Freestanding Retractable Canopies.